Known for its combination of glorious sunshine, sandy beaches and laid-back lifestyle coupled with the ease of getting there, it’s obvious why the Costa Brava is a holiday favourite with holidaymakers from the UK. 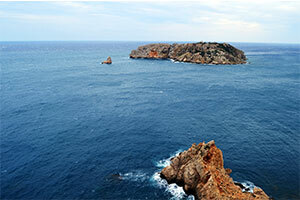 Known as the wild coast, the region stretches from Blanes to the French Border. It is a beautiful area, combining beautiful scenery and delightful villages, backed by miles of sandy beaches. Medes Islands A group of small rocky islands just off the coastal town of L’Estartit, superb for boat trips and scuba diving. Figueres Best known for the Dalí Theatre-Museum, Figueres also has a toy museum. The vast 18th century fort above the town – the Castell de Sant Ferran – is the largest building in Catalonia. Caella de Palafrugell Famous for the traditional Voltes (archways) and the Havaneres - Cuban sea shanties brought back by sailors. Great beaches and superb seafood. Gerona A beautiful city best explored on foot. Climb the steps to the magnificent cathedral, visit the Arab Baths and experience the breathtaking views from the city walls. Tamariu A charming fishing village named for the local tamarisk trees. Enjoy a stroll along the sandy beach and a dip in the clear waters of the bay before settling down for lunch in one of the charming restaurants that line the promenade. There are numerous swimming spots, as well as boat trips, canoes to rent and caves to explore. To find your perfect campsite in the Costa Brava please use our interactive site finder, call our knowledgeable customer advice team on 01 242 1901, or go straight to the individual campsite pages.